You want to drive massive traffic to your blog, don’t you? Ask a blogger who gets 1 million hits a month. Even he will say yes to this question. There are tons of ways to get traffic. Yeah, I mean it. You can find countless ways on the web. The organic traffic has become top mainstream that everyone goes for SEO now. What if I offer swarms of referral traffic? Here in this article, you are going to read how to get tons of traffic from Flipboard. How to Drive Traffic to your Blog using Flipboard? Before we dive into the meat of this post, you must know what Flipboard is. Simply put, Flipboard is a content discovery site. But in a blogger’s point of view, it is a content curation platform. You can add your articles into it. When other users find it interesting or useful, they will come to your site. There is no need to do any extra effort or a hell lot of spamming (hmm, backlink making as you say). If your content is worthy enough to get noticed, it should. Now that you know what Flipboard is, let’s check how to use it for getting traffic to your blog. How to Use Flipboard to Generate Traffic? In order to do that, you must sign up for a Flipboard account. You can use the desktop or mobile version. The mobile app is available for iOS, Android and Windows platforms. Use any of the links. You can use multiple links as well. For now, let me stick on to the desktop (web) version of Flipboard. Once you get there, you can see different featured articles on the homepage itself. Given that Flipboard has more than ninety million users, the featured articles get tons of traffic every day. Can you see a sign-up button on the top-right part of the screen? In order to kickstart with Flipboard, click on it! You get two options there; sign up with Facebook or with the conventional way of email and password. When you complete the form filling and your profile is created, you need to choose the topics you want to follow. As of now, Flipboard has more than 34000+ topics. So, you will never run out of your favorite ones to select. Before heading to create a Magzine. The very first thing you need to do right after getting sign up is to complete your profile with every required information. A complete profile has better chances to get more followers. As my personal experience, I recommend you to get a Flipboard app on your smartphone. The reason behind having a Flipboard app on your smartphone is to stay active from anywhere. Now we have to create our magazines. It is a very simple job to do without any doubts. As we discussed above how important is Flipboard app. Let me share a short tutorial on how to create a magazine in smartphone and desktop versions. Step 1: Login to your Flipboard account. Step 2: Select Magazines option just below your profile bio. Step 3: You will see a red box on the bottom right side of your screen. Click on it. Step 4: It will ask you what type of magazine you like to create. e.g: For reading, for sharing and for collecting. Step 5: You can set it to public or private. Give a title to your magazine, provide a description and Next. Done! Step 1: Go to your profile page in the desktop version. You will get an option to create your own magazine. I recommend you create different magazines for different topics. Putting all the eggs into a single basket doesn’t work here. Step 2: Give a name to the magazine. Better you narrow it down to something related to the niche. Productivity is common. So, go with something like productivity tips at the workplace or something more specific. You can create an unlimited number of magazines. So, go with different ones for each niche you want to flip. 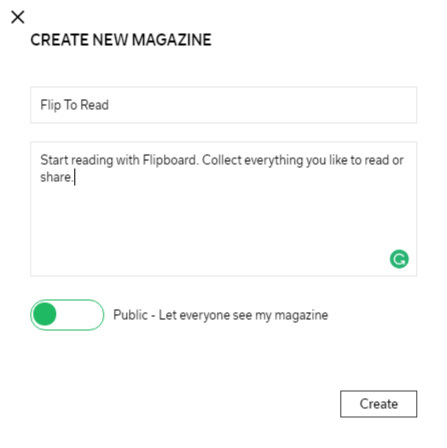 Once you get it done, you can start flipping (adding content on Flipboard) articles into the magazines. That’s it. Does this bring tons of traffic to your blog? Maybe! To increase your chances, you should increase your visibility. Follow the tips given below for that. Not just flip your own content. The more you self-promote, the less traffic you get. Don’t add time-bound content. If you share something related to Christmas 2017 on Flipboard, it will go dead within that specific time period. So, always share evergreen content with the capability to go viral anytime. Make it easy for your visitors to collect your content into their own Flipboard magazines. Install Flipboard shareable plugins or simply add their share button into your blog. You should comment on other people’s posts. I am sure that not many implement this tip. By doing this, you can increase your visibility. Don’t forget to follow influencers in your niche and add their content to your magazines. Keep a track of the number of visits you get using analytics option on your editor’s panel. Get their bookmarklet or available chrome extension for speedy content curation. Promote your Flipboard magazines using embedded widgets links into your blog or sharing your magazine link on other social media platforms. I hope you got a fairly clear idea about Flipboard and how to generate a good amount of traffic from Flipboard. If you have any doubt about this, don’t forget to comment down below. This is a really helpful, I am sure this would help me a lot. Thanks for sharing this article keep up the good work. I am a new blogger and have been wondering how I can increase traffic to my site. Your article is very helpful. Thank you for sharing. I have some ‘homework’ to do to set up a Flipboard account. Thanks for your feedback. Glad you like it. you manage to do this article wonderful. Your content curation wird for blogger was so impressive. If I tell you, I’m also doing the same with Medium.